A 2-billion-year-old chunk of sea salt provides new evidence for the transformation of Earth's atmosphere into an oxygenated environment capable of supporting life as we know it. The study by an international team of institutions including Princeton University found that the rise in oxygen that occurred about 2.3 billion years ago, known as the Great Oxidation Event, was much more substantial than previously indicated. "Instead of a trickle, it was more like a firehose," said Clara Blättler, a postdoctoral research fellow in the Department of Geosciences at Princeton and first author on the study, which was published online by the journal Science on Thursday, March 22. "It was a major change in the production of oxygen." The evidence for the profound upswing in oxygen comes from crystalized salt rocks extracted from a 1.2-mile-deep hole in the region of Karelia in northwest Russia. These salt crystals were left behind when ancient seawater evaporated, and they give geologists unprecedented clues to the composition of the oceans and atmosphere on Earth more than 2 billion years ago. The key indication of the increase in oxygen production came from finding that the mineral deposits contained a surprisingly large amount of a component of seawater known as sulfate, which was created when sulfur reacted with oxygen. "This is the strongest ever evidence that the ancient seawater from which those minerals precipitated had high sulfate concentrations reaching at least 30 percent of present-day oceanic sulfate as our estimations indicate," said Aivo Lepland, a researcher at the Geological Survey of Norway, a geology specialist at Tallinn University of Technology, and senior author on the study. "This is much higher than previously thought and will require considerable rethinking of the magnitude of oxygenation of Earth's 2-billion year old atmosphere-ocean system." Oxygen makes up about 20 percent of air and is essential for life as we know it. According to geological evidence, oxygen began to show up in the Earth's atmosphere between 2.4 and 2.3 billion years ago. Until the new study, however, geologists were uncertain whether this buildup in oxygen — caused by the growth of cyanobacteria capable of photosynthesis, which involves taking in carbon dioxide and giving off oxygen — was a slow event that took millions of years or a more rapid event. "It has been hard to test these ideas because we didn't have evidence from that era to tell us about the composition of the atmosphere," Blättler said. The recently discovered crystals provide that evidence. The salt crystals collected in Russia are over a billion years older than any previously discovered salt deposits. The deposits contain halite, which is called rock salt and is chemically identical to table salt or sodium chloride, as well as other salts of calcium, magnesium and potassium. Normally these minerals dissolve easily and would be washed away over time, but in this case they were exceptionally well preserved deep within the Earth. 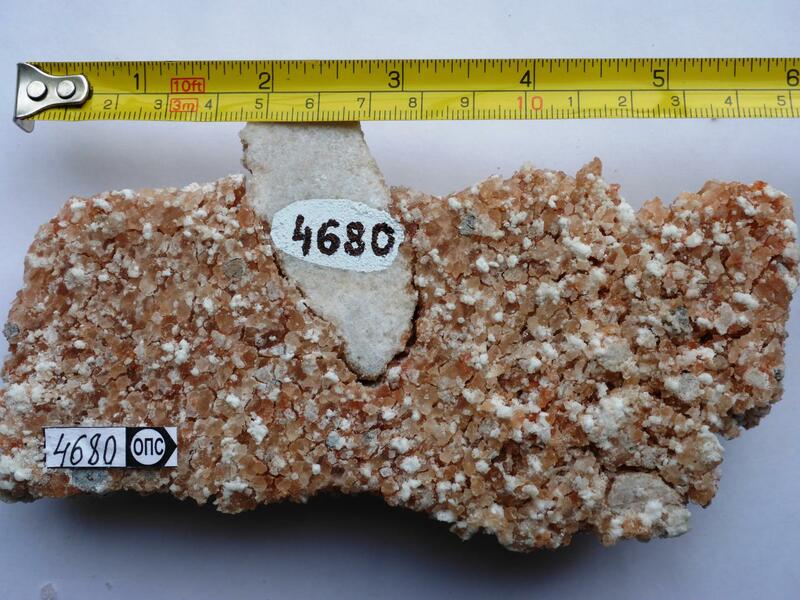 Geologists from the Geological Survey of Norway in collaboration with the Karelian Research Center in Petrozavodsk, Russia, recovered the salts from a drilling site called the Onega Parametric Hole (OPH) on the western shores of Lake Onega. The unique qualities of the sample make them very valuable in piecing together the history of what happened after the Great Oxidation Event, said John Higgins, assistant professor of geosciences at Princeton, who provided interpretation of the geochemical analysis along with other co-authors. "This is a pretty special class of geologic deposits," Higgins said. "There has been a lot of debate as to whether the Great Oxidation Event, which is tied to increase and decrease in various chemical signals, represents a big change in oxygen production, or just a threshold that was crossed. The bottom line is that this paper provides evidence that the oxygenation of the Earth across this time period involved a lot of oxygen production." The research will spur the development of new models to explain what happened after the Great Oxidation Event to cause the accumulation of oxygen in the atmosphere, Blättler said. "There may have been important changes in feedback cycles on land or in the oceans, or a large increase in oxygen production by microbes, but either way it was much more dramatic than we had an understanding of before." The authors on the study, in addition to Clara Blättler and John Higgins at Princeton, and Aivo Lepland at the Geological Survey of Norway, include: Mark Claire, Anthony Prave, Aubrey Zerkle and Matthew Warke of the University of St. Andrews in Scotland; Kalle Kirsimäe and Timmu Kreitsmann of the University of Tartu in Estonia; Pavel Medvedev, Alexander Romashkin and Dmitry Rychanchik of the Karelian Research Center in Russia; Kärt Paiste of the UiT Arctic University of Norway; Ian Millar of the British Geological Survey; Justin Hayles of Rice University; Huiming Bao of Louisiana State University; and Alexandra Turchyn of the University of Cambridge. The study was funded by the Simons Foundation (SCOL 339006 to C.L.B. ), the European Research Council (ERC Horizon 2020 grant 678812 to M.C. ), the Research Council of Norway (RCN Centres of Excellence project 223259 to K.P. and A.L. ), and the Estonian Science Agency (PUT696 to K.K., A.L., K.P., T.K.). The study, "Two-billion-year-old evaporites capture Earth's great oxidation," by C.L. Blättler, M.W. Claire, A.R. Prave, K. Kirsimäe, J.A. Higgins , P.V. Medvedev, A.E. Romashkin, D.V. Rychanchik, A.L. Zerkle, K. Paiste, T. Kreitsmann, I.L. Millar, J.A. Hayles, H. Bao, A.V. Turchyn, M.R. Warke and A. Lepland, was published online in the journal Science on March 22, 2018.